When I was diagnosed with my breast cancer I thought “They’ll cut it out. I’ll do chemo/radiation and I’ll be done with it.” What I didn’t consider was the toll all the cancer treatment would have on my body so when I was diagnosed with Lymphedema it was pretty shocking. I am very lucky. The Lymphedema in my right arm is small and manageable. I am going to see a massage therapist for MLD massage. I’ve also started seeing a physiotherapist to help me get strength back in my arm and right shoulder. I also wear a compression sleeve. In utter frustration I hit The Google looking for an alternative and found the LympheDIVA’s website. 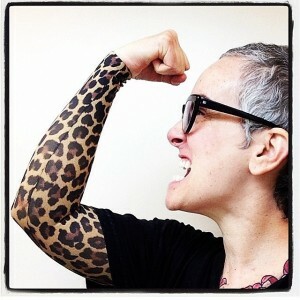 I immediately purchased a leopard sleeve and they’re wonderful. Soft. A little silky so they slip easily underneath clothing. It’s incredibly empowering to have choices and that’s what LympheDIVA’s is offering. Beautiful, bold fashion-forward choices. 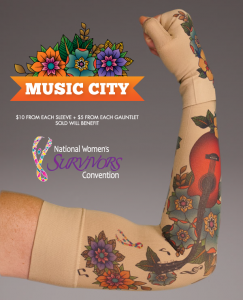 If you’re thinking about getting a sleeve LympheDIVA’s has a special sleeve on sale right now to benefit of the National Women’s Survivors Convention. $10 from each sleeve and $5 from each gauntlet will be donated back to this wonderful organization. Learn more about NWSC here. The two-sided Music City design features a microphone on one side and a guitar and the NWSC logo on the other. Super cool! AHHHH! I am so happy to have found them. 🙂 Thank you LympheDIVA’s! Love ’em! I work at a library and wear my sleeve. Just about every shift someone asks me about it – whether it’s a tattoo, or if it’s the newest fashion trend 🙂 It should be, in my opinion. Thanks to you, I found LympheDivas and ordered the beautiful koi sleeve. Love it so hard! Those sleeves are so cool! Sending you good wishes for your healing!